12 and 15 passenger vans have been around for years! These vehicles have made it easy for groups to transport large amounts of passengers in one van. The vans have been made by various companies including Ford, Chevrolet, and Nissan to name a few. Each company has its own take on the vehicle. So what exactly is the difference between these two giants? Well first it depends on which make and model you are looking at. Both Ford and Chevrolet make 12 and 15 passenger vans. Ford makes the Econoline Van and Chevy makes the Express Van. They both come in cargo or passenger versions. The passenger versions of the 12 and 15 passenger vans have windows versus the solid side style that comes with the cargo vehicles. The main difference between the 12 and 15 passenger is the vehicle chassis. 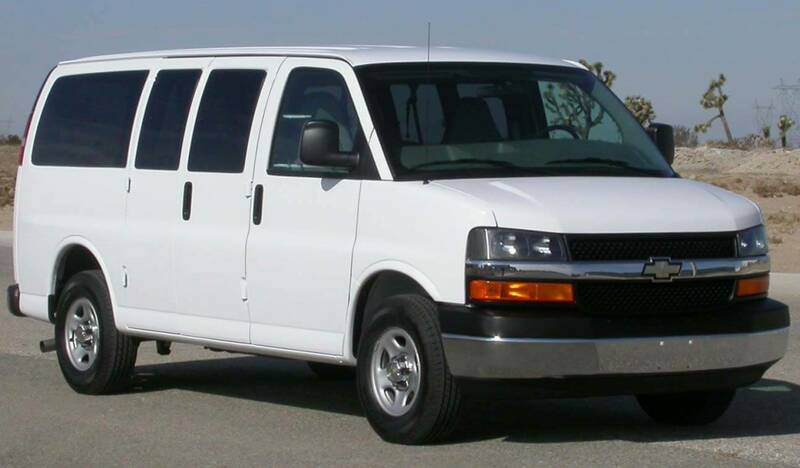 The 12 passenger van, is on a shorter chassis, then the 15 passenger model. This is important to remember for things like turning radius of these vans. It also has an effect on how much luggage one can haul in a passenger van. With the 15 passenger model it is possible to remove the final row from the vehicle to allow space for luggage. This is something that is very common with shuttle companies like Powderhound Transportation whom remove seats from 15 passenger vans in order to accommodate passengers and luggage. With the seat removed from a Ford or Chevy 15 passenger van you can accommodate 11 passengers including driver plus luggage. With the 12 passenger model, removing the final of seats would allow for space 8 passengers including driver plus gear. This make the 15 passenger van a much better choice for groups of 8 or more whom have gear. If you are strictly using the vehicle as a people mover the 12 passenger model can transport 12 riders including driver. Other companies like Nissan with their model the Nissan NV offer a great style of mini bus with the ability to transport 12 passengers. These vans are very practical with the ability to configure seats in multiple different ways. The Nissan NV offers the ability to transport 12 passengers including driver. You have to do some rearranging of seats in order to transport passengers with luggage. Depending on the amount of luggage you would have to remove a certain amount seats to accommodate passengers and luggage. Being in the business of van rentals Switchback has worked with various types of passenger vans. It’s important to realize the difference between them so you are able to purchase or rent the model that fits your needs for the van. If you have any questions about this blog post please contact our blog staff.